Start from the tiles, which usually comprise a huge part of the toilet area including the walls, countertops, and floors. Sometimes, people skip this step especially when they deem the existing ones will do. However, changing the tiles altogether allows you to achieve optimal results in the end. Carefully consider your options not only in terms of style and design, but choose among durable and waterproof flooring that will keep you safe and give you a long-lasting investment in return. Ceramic, stone, and marble are popular choices for both aesthetics and superior qualities, which can be used as flooring and wall enhancements. When choosing wallpapers, put your money in the kind that can withstand splashes and splatters of water for a long-lasting toilet wall feature. See to it that you purchase furnishings and fixtures that is not really the cheapest nor the most expensive of all. Look for materials that exhibit class, reliability, and durability, having been designed for long-term bathroom use. Some Singapore homes were not built with a very big bathroom, nor can the toilet area be increased due to limited space. In this case, full-sized mirrors can make a huge difference. Incorporating mirrors in your wall during the process is a great part of a toilet renovation work plan. Though it won't literally increase the space, your toilet will seem bigger and more comfortable with the elegance of clean and clear mirrors or glass. 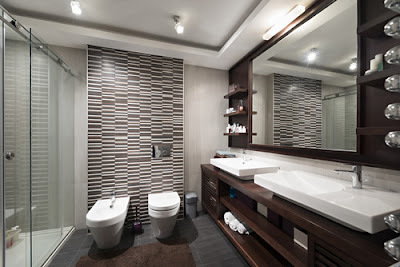 If you already have a big bathroom, then at least one or two regular mirrors will do. It's not necessarily full-sized types, but stylish ones for both its functional purpose and aesthetic effect. You can opt for glass material even for the doors itself, which exhibits the open concept wherein the bath is directly connected to the bedroom with just a glass door. It's perfect for homes where this kind of setup is comfortable and acceptable for the people who live in it. Having a bathtub is sheer pleasure and lets you indulge in a luxurious bath once in a while right in your own home. If space in your toilet does not permit the size of a bathtub, it doesn't mean you will have to do without one and feel you're missing out on the opportunity to own a tub. A great alternative is a soak tub, which grants you luxury and relaxation much like a bath tub experience. A soak tub is generally shorter in length, but deeper compared to a bath tub which makes it perfect for small bathrooms. This option lets you incorporate a tub easily in your toilet renovation project without worrying about the space it will take up. The thought of exposed pipes alone is not so attractive, and it's common to plan on covering them with furniture or other material in the bathroom. However, obscured pipes often prevent early detection of leaks and other plumbing problems. You can instead leave the pipes exposed as a decorative art piece that can contribute to a contemporary bathroom look. It's the latest trend of transforming the toilet area into a unique and gorgeous part of the home without the added expense. Simply paint the exposed pipes and get creative. Mix and match with the color of your sink and pick a shade that blends well with your theme and preferred color combination. Some toilets do not allow a lot of space to add extra pieces of furniture, but good quality fittings can effectively create more space in the bathroom. Fittings can help you optimize each and every corner and available portion of your bath area to render functional, while stimulating the look of a comfortable toilet space. Different kinds of fixtures can complement your theme and endow your toilet its own style, while giving you everything you need within reach. Fixtures pertain to the basin, sink, shower heads, faucets, pipes and taps, and other essential accessories to complete the bathroom setup and ambiance. You can make your toilet renovation more fun with a personalized touch, such as enveloping the bathroom in a cool under the sea, beach, or pirates theme. Turn two bathroom areas into one and come up with a bigger and better toilet at home. 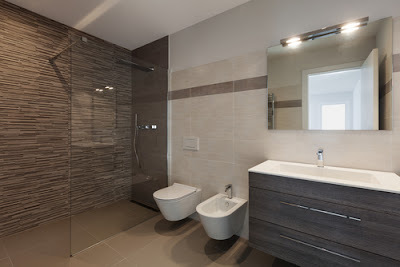 This can be achieved by demolishing the adjoining wall that connects your shower and toilet space, which does not only relieves the space the wall once occupied, but creates a modern bathroom look. 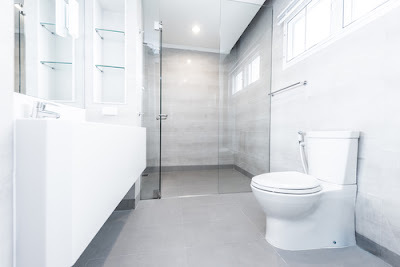 There are instances wherein two adjacent bathrooms can be turned into one, which downsizes to just one toilet within the house, but a much more spacious personal private space for your to enjoy luxury whenever you wish. Another alternative is to use a glass wall instead of the bulky type of partition. With these 6 steps, you can remodel your bathroom on a budget. Make certain that nothing is overlooked during the process, including the installation of electrical and energy devices, ventilation, aside from the plumbing components. You can avoid encountering trouble along the way and unnecessary expenses in the future if everything is taken care of during renovation. It's best to seek the help of experts and professionals who can guide you in decision-making from planning to designing up to the finishing touches.